i don't know where i found the 2 personn but i thought that they will be nice in this kind of wall. Wow, I love it! The background works so well and the shadow is a very nice touch. I will be adding this one to my favourites :) . An interesting wallpaper. Its a very nice background, its also a very good scan choice as well. 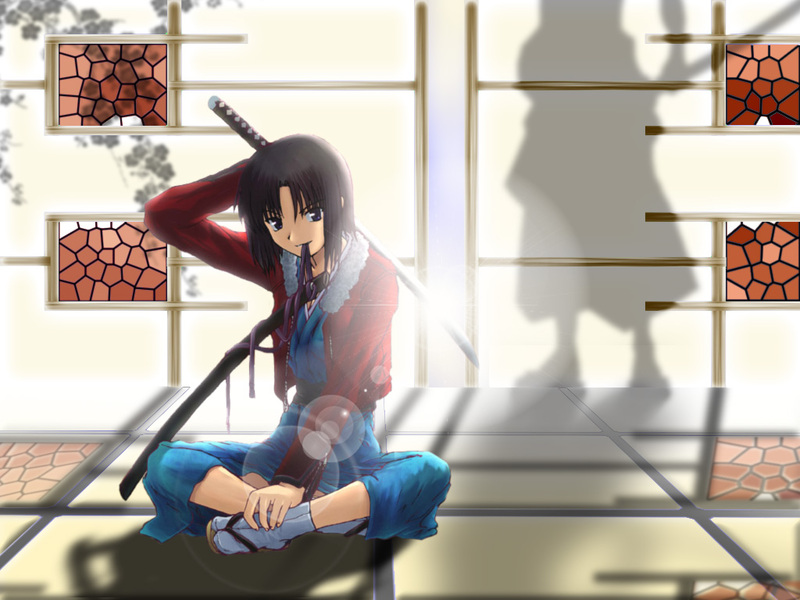 grat wallpaper, i like the pose of the charas and the background looks very interesting. Wow, very nice. Someone else standing in the bckground there? though there is a slight problem in your shadow desing. The light at the back does not coincide with the shadows. The light maybe should be placed a little higher? It's so bright. Like that very much. Definitely my favourite. Plus, the scans you've chosen are great for the background. Hi again ! I see you made pretty cool wallpaper, there is really nothing to complain about. i like the scan and the bg u did. I especially like the whole bg . I feel uneasy about the lense flare (?) in the middle , I thought it could be better off without. The connection in between the wall and the floor could be much more defined. Very nice concept there. I really like this one of yours. And its samurai. Always a big plus with me. i must say that this is a fave for me. not much to complain about..
Good idea you have put in the wall! Thanks for sharing big size image! I love the background and the concept! Nice effect with the light, congratulations! The background really brightening up the whole wall, lighting is good as well.